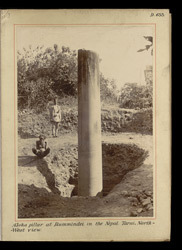 Photograph of the Ashokan pillar at Rummindei [Lumbini] taken by an unknown photographer for the Archaeological Survey of India Collections: Northern Circle (North-Western Provinces and Oudh) in 1896-97. Ashoka (r 272-231 BC) was a Mauryan king who converted to Buddhism in the middle of his reign and spent the rest of his life propagating his dharma (law). In order to spread the word of Buddhism he had numerous edicts inscribed on pillars and placed throughout his empire. While the pillar in this view was erected in the 3rd century, it was buried from the 15th to the 19th century until it was unearthed by a group of archaeologists in 1896. Lumbini is the town in Nepal where Prince Siddhartha, who after enlightenment becomes Buddha, was born in 623 BC. This pillar stands at over 22 feet tall and a well preserved inscription in five lines states that it stands in the area where the birth occurred.